Did you know that not all parents instantly fall in love with their newborn baby? The new parent must feel really horrible, and guilty about it. Especially when there’s a hype from everyone else and every other new parent seems to experience this immediate connection with their baby. I feel similarly with Qur’an. I think there’s an unrealistic expectation that you’ll experience this overwhelming emotional connection to it. When we first started translating Surah Baqarah I felt annoyed to be honest; annoyed that the Yahūd were mentioned so much in our Qur’an. I was told I’ll cry everyday. I didn’t. I cried once in class – for the whole year. That was it. Someone once likened it to meeting a new person, with some people you feel an instant connection yet with others it takes a while, maybe a good couple of meetings, to get to know them before you form a bond. 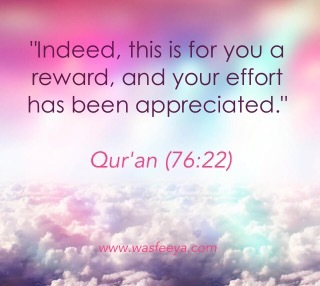 If you found an instant connection with Qur’an, say Alhamdulillah to the nth degree. But this post goes out to those who haven’t quite felt it. Yet. Especially to those who feel guilty or feel like there’s something wrong with them. Don’t give up. Keep going back. Again and again. I went to class every day regardless. And then one day, smack bam! This one ayah just hit me. I said I only cried once in class. But once was all I needed. It was a life-defining moment. I yearn for every ayah to feel like that. Like Allah is speaking directly to me. Like every ayah was revealed just for me. But it doesn’t. Not yet anyway. Memorising and review (what I’m currently in the midst of) can become monotonous. 30 ajzaa later, I’m still struggling. So I advise myself, before anyone else, once again: don’t give up. Ever. I admire young people who dedicate there youth to Allah. I didnt evens think of Allah at your age. The story of the janitor brought me to tears it opened my own eyes and made me question how much I love Allah. And I say shukran to you. Im not Haafiz but I do read the english quran on a daily basis. I read your latest blog. And I must say sura Al baqrah spoke to me on so many levels not just in my own life but the lives of others. Like I would tellyou 15 yr old son the verse that reminds me of him is “what you dislike may be good for you and what you like may be bad for you”. I think you are to hard on yourself with obtaining knowledge the quran was revealed over 27 years. And it’s not the amount of it you no but how much of it speaks to your soul. And I say it to you with the utmost respect cause I might be wrong your knowledge in deen far exceeds mine. But I think you must allow yourself time. You are so powerful there is a reason Allah chose you to learn his deen. I think you must have a more holistic approach. Instead of concentrating on memorising Allah the quran to unfold and speak to you. So you may unlock the beauty within you and the beauty within Allah words. Continue to write and inspire many women like myself. Jazakillahu khaira for taking the time to comment; it’s much appreciated, and for reading my blog. May Allah SWT guide and protect you & your daughter throughout your lives. Āmīn. You may be right; I might be too hard on myself, it’s only been a few years since my relationship with Qur’an began. I thank you for your kind words. Please make du’a for me. May Allah SWT grant us all sincerity, true love for the Qur’an and beautiful characters. Āmīn.